Sothink SWF Decompiler - прекрасный инструмент по конвертированию SWF в FLA. Загружайте, играйте и просматривайте Shockwave Flash видео (swf или exe). SWF Decompiler, полностью совместимый с ActionScript 2.0/3.0. Программа совместима со всеми SWF элементами, такими, как ActionScripts, звуки, изображения, видео, формы, рамки, точки, тексты, кнопки в различных форматах. Программа предназначения для извлечения различных ресурсов из Flash-клипов. Простой и понятный интерфейс, поддержка экспорта в .FLA-формат. Имеется удобный модуль для захвата Flash-клипов прямо из браузера. Sothink SWF Decompiler is a professional tool to convert SWF to FLA fully and extract elements from SWF into variable formats. Compatible with all SWF versions and converted FLA is from version 6.0 to version 8.0. You can get the fully FLA file including linkage, components, *.as, etc. Also you can choose to extract ActionScripts as txt or bin, sounds as mp3 or wav, images as jpg or bmp or png, videos as flv, shapes as gls, frames/fonts/texts/buttons/sprites as swf to your local computer after an SWF is decompiled. Both SWF and EXE (Flash project) files are supported. 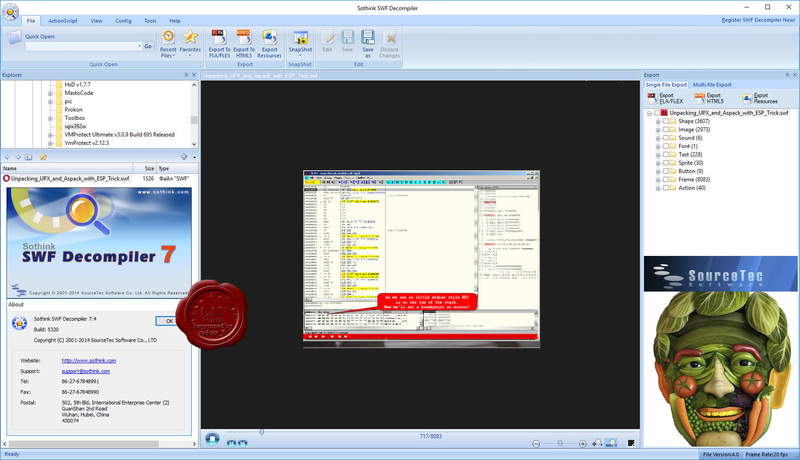 Sothink SWF Decompiler provides a user-friendly interface. A built-in player enables you to preview the movie and every element before exporting. And you can customize the interface layout to meet your needs. To make SWF Decompiler even more appealing, SWF Catcher is offered freely. It is a free tool that can capture Flash movies you are viewing in the browser.